Like most accomplished accordionists, Larry Malmberg began his extraordinary career at a very early age. His musical career glittered with significant names: Dinah Shore, Pavaratti, accordionist for the Moscow Circus Orchestra which recorded live for the Ed Sullivan Show (1962), the Minnesota Orchestra, the Minnesota Opera and the St. Paul Chamber Orchestra. He was the Accordion Instructor at the University of Minnesota for over 20 years. 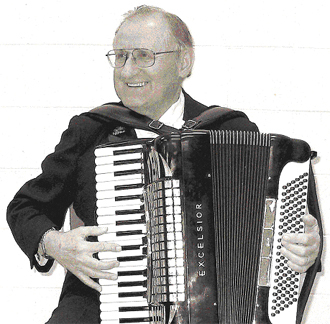 Larry taught literally hundreds of accordion students including 1963 Coup Mondale winner Skeets Langley. Larry Malmberg passed away at the age of 86 in Sept. of 2009 leaving behind numerous hand-written works he had arranged for his students over the course of 60 years of teaching. These arrangements have been carefully transcribed to a computer format by son Denny Malmberg, also a noted accordionist, via this website. The arrangements are graded by student ability level ranging from Grade 2 (1st or 2nd year student) through Grade VIII (advanced players). One of Larry's greatest attributes was his ability to perform and write in idioms ranging from classical, polkas, country, latin to jazz music. Watch for additional works coming within the next few months.